First brewed by New Belgium Brewer Eric Salazar in 2008, the brewery recently decided to re-release their Lips of Faith Series favorite Eric's Ale. And I couldn't resist checking it out since my only memories are a few long-ago sips at a bottle share or two. If you don't look closely at the bottle art, you may not realize that's a peach surrounded by a maze of hop bines. 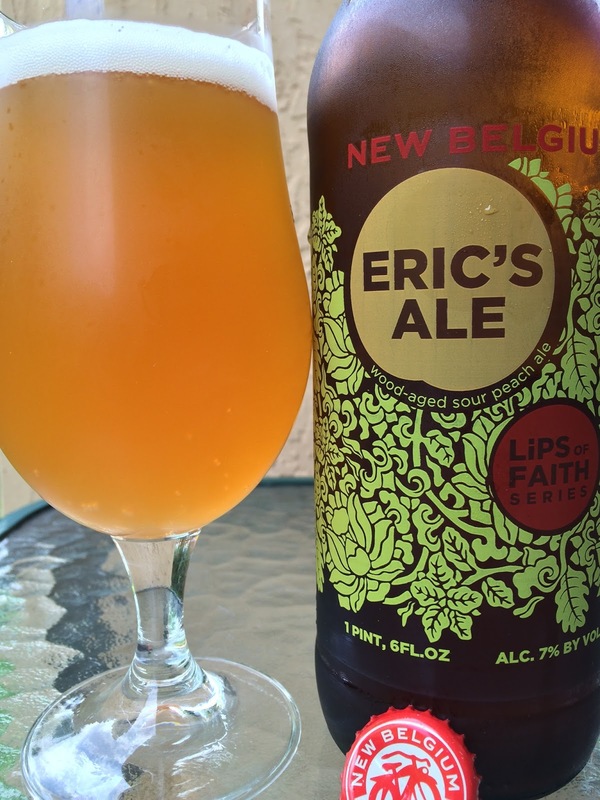 Eric's Ale is a French Oak-aged sour peach ale. 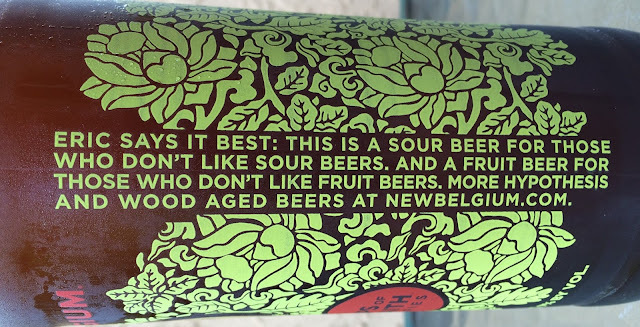 Eric about his beer: "This is a sour beer for those who don't like sour beers. And a fruit beer for those that don't like fruit beers." 7% alcohol. Best Enjoyed By April 2, 2017. Aroma is big and full of peaches with a little acidity and tartness. Sweet and sour start, excellent back and forth action. Lots of peach flavors dominate to start. Orange and light tropical nuances also follow. Very juicy! Then the switch to some acidic tartness which cleanses the palate. Repeat! Not even sour in the slightest. Some light yeasty funkiness and woody character are noticeable but background complexities. Slightly dry at the finish. Very flavorful and super refreshing. Definite winner!